Reservations: Minimum 3-night stay. Deposits can be paid by Visa or MasterCard, or if on location, Cash or Debit. Balance to be paid upon arrival. Availability: All cabins offered by the Resort are subject to availability and the discretion of the Caretakers. Cancellation Policy: Cabins are reserved on a guaranteed basis. No refunds will be issued for cancellations made less than 30 days from scheduled arrival date. A full refund less a 10% administration service fee will be refunded in the same manner as paid for all other cancellations. Check-in & Check-out: Guests must present a valid personal ID or passport when checking in. Cabins are made available to guests from 2:00 pm. Guests must check out before 11:00 am on the day of departure. All late departures are subject to a late fee, at the discretion of Resort Caretakers. Tween Lakes Resort is privately owned and located on private property. We reserve the right to refuse services. We have the authority to enforce rules and regulations by fine, suspension, removal and/or revocation of privileges. 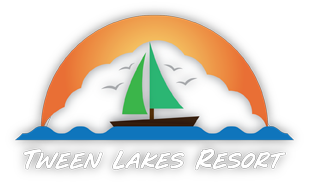 Tween Lakes Resort is not responsible for fire, lost or stolen items, damages or expenses, and any other sums which did not result from any breach of contract or other fault by the Resort. * Pets are permitted and subject to a $50 fee per pet. Pets must be well behaved and on a leash at all times. Owners are responsible for cleaning up after their pets while at the resort. Tween Lakes Resort is equipped with a dock and does have moorage slips available for our guests. All rental slips will require proof of valid liability insurance for your vessel .